Saute 200g sliced shallots (small onions) and 3-4 green chillies with 1 teaspoon oil. 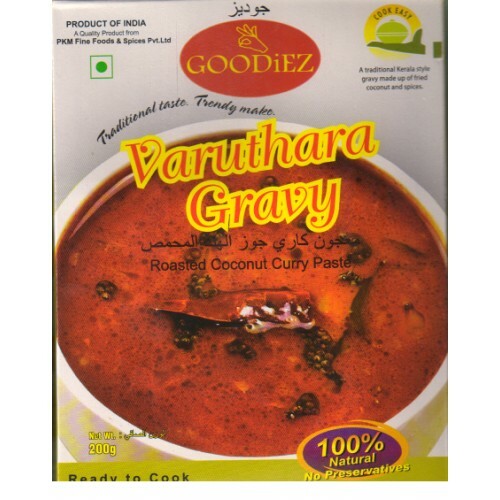 Add 50g Goodiez Varuthara Gravy and 250ml water into it. Add salt and tamarind juice to taste. Cook to 5–10 minutes or till the gravy is thick. Season with fried mustard and red chillies if required. Take 1 kg cleaned chicken pieces, half portion of Goodiez Varuthara Gravy and 750 ml water in a pressure cooker. Cook to 2 whistles. Add rest of the gravy in to it and boil till the gravy is thick. Add salt necessary. Can season with fried mustard and red chillies. It can be used for the preparation of kadala (Bangal Gram), Meat, Sambar, Prawns and other sea food Varuthara Curries. Ingredients: Coconut, Coriander, Red Onions, Ginger, Sunflower oil, Salt, Chilly, Curry Leaves, Garlic, Turmeric, Pepper.